The combination of its hybrid business model and the wider use of more efficient, passenger-appealing new aircraft helped Latvia’s airBaltic to carry a record 4.136 million passengers last year, 17 per cent up y-on-y, making 2018 the most successful year in its history. In 2018, utilising four additional aircraft, airBaltic operated a total of 56,261 flights, 12 per cent more than in 2017 and the airline’s average load factor of 75 per cent slipped by one percentage point only in the period. Despite the rigours of expansion, the Riga-based airline kept its high 88 per cent dispatch reliability last year, thereby retaining its position as the most punctual airline in Europe and the second most punctual in the world, according to the OAG ranking of the best on-time airlines. “Our airline has a strong and efficient hybrid business model, as well as loyal passengers and dedicated employees. In addition to our new aircraft, we were able to continue our sustainable growth and build the groundwork for future success,” enthuses Martin Gauss, airBaltic’s chief executive. In 2019, the airline will continue to grow by adding at least six new routes as well as introducing extra capacities on some existing destinations. 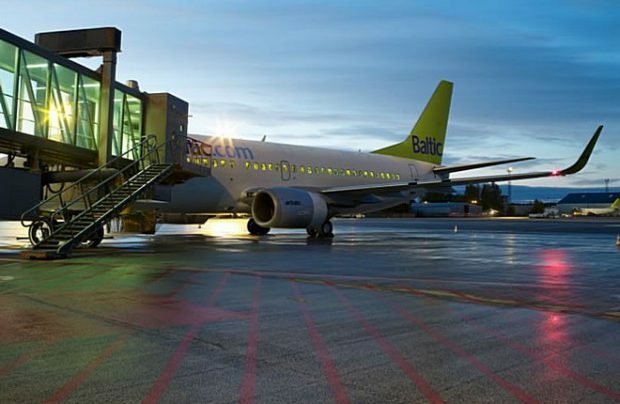 From its main base at Riga airport, airBaltic will launch flights to Dublin, Stuttgart and Lviv, and to strengthen its positions in its key Baltics region market, it also plans to grow its presence at Tallinn, the capital city of neighbouring Estonia, by adding flights from there to Malaga, Brussels and Copenhagen. To realise its ambition of becoming the air transport linchpin of the Baltics, the airline is to proceed with further fleet renewal and expansion plans, focusing exclusively on the Airbus A220-300 (formerly known as the Bombardier CSeries 300) aircraft. Last year airBaltic added seven new A220s, while phasing out three Boeing 737 Classics, thereby finishing 2018 with a fleet of 34 aircraft consisting of 14 Airbus A220-300s, eight B737CLs and 12 Bombardier Q400 next-gen turboprops. This year the Latvian flag carrier plans to add eight more A220-300s, rendering it capable of operating 22 of the type by the end of 2019. Currently, airBaltic serves more than 70 destinations from the capital cities of Latvia, Estonia and Lithuania, offering the largest variety of destinations via Riga to its network spanning Europe, Scandinavia, the CIS and the Middle East. Established in 1995, airBaltic is a joint stock company. Its primary shareholder is the Latvian state, which holds 80.05 per cent of the stock, while Lars Thuesen holds around 20 per cent through his ownership of Aircraft Leasing 1 SIA.